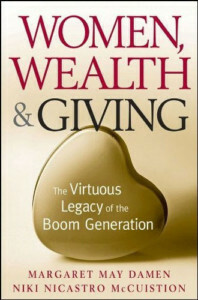 Margaret May’s latest book, co-authored with Niki Nicastro McCuistion, published by John Wiley & Sons, 2010. Discover gender-specific tools and strategies boom-generation women can use to make philanthropic and charitable decisions. Hardcover or e-book, 232 pages. 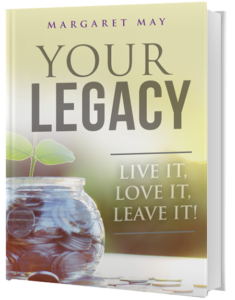 Your Legacy: Live It! Love It! Leave It! Praise for Margaret and her book. Values frame the story of who you are, what you believe, and how you make decisions. In the center of each card is a specific, value-based word. 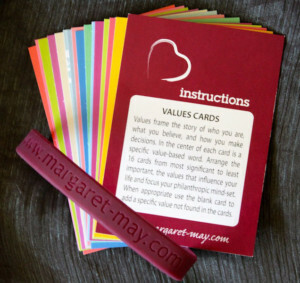 Arrange the 16 cards from most significant to least important, the values that influence your life and focus your philanthropic mind-set. When appropriate, use the blank card to add a specific value not found in the cards. Cards come with instructions and a burgundy bracelet, packaged in a burgundy organza bag that is perfect for gift-giving. This beautiful, yet functional perpetual date calendar features inspirational quotes from world-famous personalities. This calendar makes a marvelous gift or an indispensable accessory for your home or office. When filled with birthdays, anniversaries and special events, it is a permanent reminder of Memorable Dates to Cherish. Elegant presentation with burgundy ribbon. Dimensions: 4.25″ x 10″. 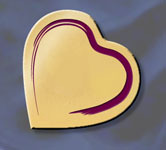 This brass, heart-shaped pin with burgundy accent is a reminder of the principles illustrated in Margaret May’s book, Women, Wealth & Giving: The Virtuous Legacy of the Boom Generation. Wear you heart and proudly display you are a “Woman Making a Difference” in your community with your heart, head, and hand. This distinctive lapel pin signifies you are a virtuous philanthropist living the Three Principles of Abundance: 1) Every Woman is a Philanthropist, 2) Every Woman Makes a Difference and 3) Every Woman has a Legacy. Packaged in a burgundy organza bag, perfect for gift giving.